Did you know that clutter can actually impact your mood? At least, that’s what a group of experts at UCLA’s Center on Everyday Lives and Families recently found when then explored the relationship between 32 California families and their belongings. 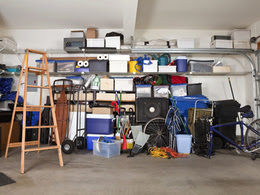 Particularly for women, stress levels go up when there is too much stuff cluttered around them. On the other hand, men in the family were relatively unaffected by the mess around them. In other words, there are a lot of stressed out moms out there looking for ways to de-clutter their lives. It’s time to get creative, kill the stress, and put your life in order with these fun and creative storage hacks that will help you de-clutter your living space. LifeHack recommends making sure that everything has its place even if it means buying containers for your knickknacks. The problem is that buying more bins for clutter- prone households could end up backfiring. Instead, start weeding out the things you want to get rid of first. Then find creative ways to store or showcase what is left. The last thing you want to do is purchase containers to store the stuff you don’t really need to keep in the first place. #1: Office Organizers: You know those wire mesh stacked hanging file folders you see in offices? They can have many great uses outside the office. Consider them for your mail, your shoes or flip flops, storing pot lids, hair styling tools, and more. #2: Multi-Purpose Shoe Racks: Clear plastic shoe racks – the kind that hang over the back of your closet door – can be used to hold more than just shoes. Do you have a nail polish collection? Store like shades in each shoe pocket to create a colorful mosaic. Hang one in the pantry to keep small items, spice jars or even your tinfoil and saran wrap. They’ve even been seen on sites like Pinterest holding office and craft supplies, jewelry, children’s toys and more. #3: Wine Racks: In addition to keeping your wine organized and your kitchen stocked, wine racks can be a great addition to your guest bathroom to store your rolled-up bath and face towels. This is a creative way to keep your bathroom organized, especially for guests. #4: Closet Extenders: Buzzfeed gets the credit for this gem of an idea. Take soda can tabs and hook them on your hangers to add an extra loop for another hanger. You can double your closet space just like that. Or, hang your scarves from one hanger using shower rings as holders. #5: Magnetize Things: Magnetizing smaller containers to keep them in one place can be a great idea for smaller items like hair pins, spare buttons, push pins and more. Simply attach a magnet to the small container and let it affix itself to the metal of your choice. These are just a few of the many ideas that can be useful when decluttering your home. Remember, you don’t want to wait until it’s time to sell your home to start enjoying it. Declutter today and wipe the unneeded stress out of your life.